Pondicherry is a Union Territory of India. It is a former French colony, consisting of four non-contiguous enclaves, or districts, and named after the largest, Pondicherry. 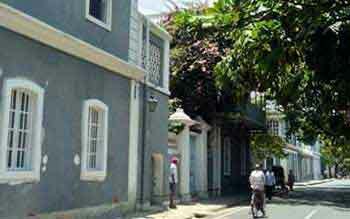 In September 2006, the territory and the city changed its official name from Pondicherry to the vernacular original, Puducherry, which means "New village". It is also known as The French Riviera of the East. It was the former capital of French territories in India. It was established in 1674 by Francoise Martin, the first director of the French East India Company. The town is laid out in a grid pattern, with parallel streets cutting across each other at right angles.Pondicherry main promenade, the 3-km (2-mile) long goubert salai running along the Bay of Bengal, formed part of the French Quarter, with its elegant colonial mansions, tree - lined boulevards, parks, bars and cafes. The museum also displays rare bronzes and stone sculptures from the Pallava and Chola periods. Among the artifacts excavated from nearby Arikamedu, an ancient port that had trade links with Imperial Rome, are beads, coins, ornamented oil lamps, funerary urns and fragments of pottery and china. Aurobindo Ashram is Pondicherry's best-known landmark. The Aurobindo Ashram dominates life in this town. Founded by Sri Aurobindo in 1926, the Ashram is a peaceful retreat with tree - shaded courtyards. The flower - festooned Samadhi (memorial) of Sri Aurobindo and the Mother lies under a frangipani tree in the main courtyard. This memorial, with two chambers, one above the other, is the focal point for all disciples and followers. The serene ashram organizes regular meditation sessions to which all are welcome. Sri Aurobindo Ghose was a Bengali poet - philosopher who was part of the struggle for freedom in the early 1900. Being known to the British for his extreme views he took refuge in the French territories where he was drawn into anew spiritual life. In Pondicherry he studied and wrote about the principles of Yoga. "The Mother" was a French woman named Mirra Alfassa who was an able painter and musician and arrived in Pondicherry with her husband during World War I. The Sri Aurobindo philosophy inspired her to establish the Aurobindo Ashram. The Botanical Garden was laid out in 1826 and was designed in the formal French style with clipped trees and flower beds. The French introduced many exotic trees and shrubs from all over India and the world many of which are still here today. It is the home of 1500 species of plants and one of the best botanical gardens in South India. 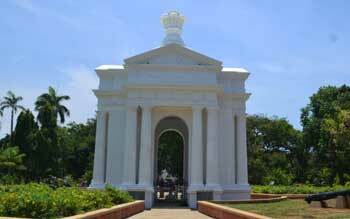 It offers many quiet paths to wander along so visit this during your Pondicherry tourism. The International Commune, with 40 settlements with names like Grace, Serenity and Certitude has 550 permanent residents. The town was meant to bring people from different castes, religions and nations under one roof, so they could live in harmony. Two of the settlements Fraternite and Harmonie sell handicrafts made by local artisans. The Matri Mandir is a meditation centre that has a spherical marble chamber inside it containing a crystal that reflects the sun's rays. The concentrated light acts as a focal point for meditation. Pondicherry consists of four unconnected districts: Pondicherry, Karaikal, and Yanam on the Bay of Bengal and Mahe on the Arabian Sea. Puducherry (Pondicherry) and Karaikal are by far the larger ones, and are both enclaves of Tamil Nadu. Yanam and Mahe are enclaves of Andhra Pradesh and Kerala, respectively. The territoryis a total area of 492 km². Pondicherry tourist places are as follows. Auroville "the City of Dawn" is located 8 kilometers northwest of Pondicherry and it was designed by French architect Roger Anger in 1968. Conceived as an utopian paradise by The Mother, Mirra Alfassa, it was planned as a futuristic international city, where people of goodwill would live together in peace.